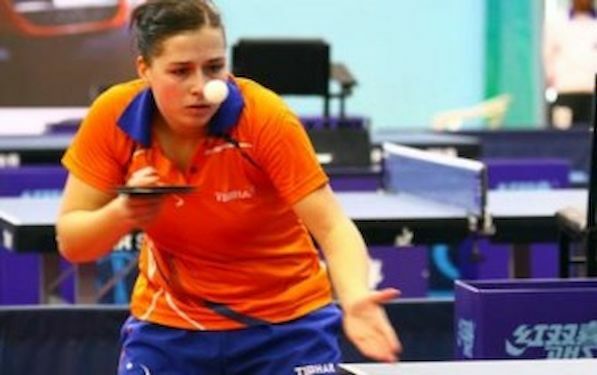 At the GAC Group 2013 ITTF World Tour, Belarus Open, Euro Africa Challenge Series Linda CREEMERS, the no.6 seed, accounted for Serbia’s Anamarija ERDELJI (6:11, 11:9, 11:8, 13:11, 11:8) and thus progressed to the semi-final stage of a Women’s Singles event on the ITTF World Tour for the second time in her career. That was the biggest upset of the quarterfinal stage where we also saw three close calls in remaining matches. The close calls were experienced by Russia’s Polina MIKHAILOVA, Germany’s Sabine WINTER and the host nation’s Alexandra PRIVALOVA. Polina Mikhailova, the top seed, beat Japan’s Eka SO, the no.5 seed, by the very narrowest of margins (11:6, 9:11, 8:11, 8:11, 11:4, 11:7, 11:9), whilst Alexandra PRIVALOVA, the no.3 seed, was extended. She needed the full seven games to beat Korean qualifier LEE Eunhye (11:8, 8:11, 8:11, 11:9, 11:8, 11:13, 11:3) as did Germany’s Sabine WINTER, the no.4 seed, by Russia’s Maria DOLGIKH, the no.8 seed (16:15, 11:4, 9:11, 4:11, 5:11, 11:9, 11:3) In men’s Singles Event Evgueni CHTCHETININE of Belarus beat Admir DURANSPAHIC of Bosnia and Herzegovina in straight games (11:3,11:3,11:3,11:4), whilst Vasily LAKEEV needed seven to overcame Grigory VLASOV in all-Russia’s duel (6:11,11:6,7:11,11:4,11:7,8:11,7:11). In the semi final CHTCHETININE will meet Japan’s Kaii YOSHIDA whilst LAKEEV will play against Kohei SAMBE also of Japan.